These Sweet Potato biscuits are the best! They are really good slathered with butter and honey and served with coffee. They are great as a snack or with a meal. If you are not a sweet potato lover, you will still like these biscuits. They are just plain good! We love them for breakfast but they are good anytime. Whisk together the flour, sugar or honey, baking powder, salt, cinnamon and nutmeg in a large bowl. Cut in the butter until mixture resembles coarse crumbs. Add the mashed sweet potatoes and buttermilk. Stir to combine all ingredients and turn out onto a floured surface. Cut out with biscuit cutter. (I use a 14 ounce size tin can to cut out these biscuits). Spray a baking sheet with cooking spray and bake in preheated 450 degree oven 12 to 15 minutes. Can brush the tops with melted butter. Makes 10 to 12 biscuits depending on how large you make them. Enjoy! These Sweet Potato Biscuits are the perfect way to start the day! Whisk together the flour, sugar or honey, baking powder, salt, cinnamon and nutmeg in a large bowl. Cut in the butter until mixture resembles coarse crumbs. Add the mashed sweet potatoes and buttermilk. Stir to combine all ingredients and turn out onto a floured surface. Cut out with biscuit cutter. 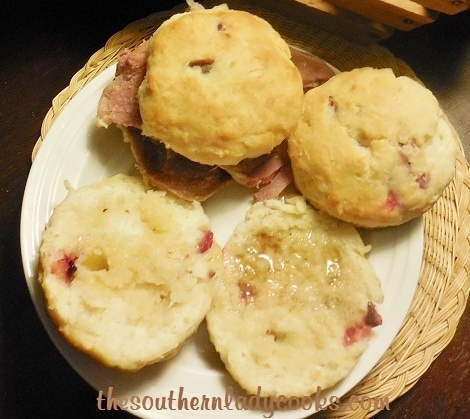 (I use a 14 ounce size tin can to cut out these biscuits). Spray a baking sheet with cooking spray and bake in preheated 450 degree oven 12 to 15 minutes. Can brush the tops with melted butter. Makes 10 to 12 biscuits depending on how large you make them. If you like this recipe, you might also like my recipe for Pumpkin Biscuits. Don’t forget to Pin our Fluffy Sweet Potato Biscuit Recipe for later! CAN YOU USE BAKED SWEET POTATOES IN THIS RECIPE , HAVE SOME LEFT OVER FROM ANOTHER LUNCHEON ? Yes, I think that would work, Faye. Have made these using canned pumpkin puree….not pie mix…..and they are pretty good, as well. Serve with fresh made roasted butternut squash soup and crisp fried country bacon……Fall supper is served! They are also fabulous with cheddar cheese melted on top for breakfast!